Having four sons here, I'm always intrigued by books that promise to help me figure them out. 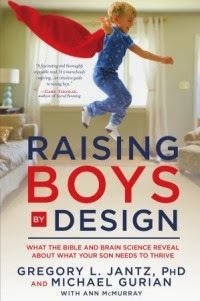 Raising Boys by Design by Dr. Gregory Jantz and Michael Gurian is the latest title to catch my eye. And it is a good one. This unique resource combines the latest research in brain science with timeless trths from the Bible to reveal the deepest needs shared by every boy of faith while also leading you to fresh insights for honoring the unique personality, talents, and god-given design of your son in particular. Once I did start reading, I was very interested. I've read a lot of books about raising sons, and this one is hitting things from a different perspective. The publisher's comments about "fresh insights" really are true. This isn't just the same "boys are different" mantra, nor is it just the observations about how we have in the last half-century or so designed classrooms and a lot of society so that more typical "girl" behavior is what is rewarded, and typical "boy" behavior is punished and/or medicated. This gets into a lot more in depth material and gets into more practical suggestions. One chapter fairly early in the book talks about the types of parenting that dads tend to do (the previous chapter was about moms). Parenting behavior that boys need (and I presume girls do too) and some information on why it is important. I'm a merit badge counselor for a group of Boy Scouts for their Family Life merit badge, and I fully intend to use some of the material from this chapter with these young men when they are to discuss roles of a father in a family. Practical, insightful, and it gave me new information. That's a ringing endorsement from me. You can get a sneak peek at Waterbrook Multnomah's website.